When you look at Splatoon on paper it doesn’t sound all too appealing. A third person online shooter where points are awarded based on how much ink you cover your surroundings in rather than how many kills you rack up seems a little unorthodox and more “family friendly” or as I like to put it – Nintendo in a nutshell. It’s so odd to hear myself saying Nintendo have delivered a fantastic competitive shooter but they certainly have with Splatoon. What could have easily been another team deathmatch-style affair is refreshed and revitalised in a way no one could have expected from any other company and here’s hoping we see more of the squids on NX. However after a few matches it all clicks. Everything (for the most part) just seems to gel so well. Any concerns that Nintendo’s first foray into the world of competitive shooting would be a let-down need not worry. Splatoon is as competitive as they get. 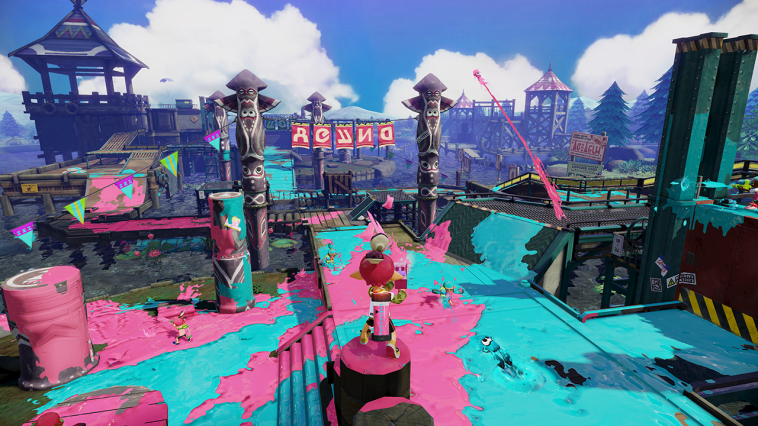 Whether you’re trying to claiming a moving tower, dominate with the uber-powerful Rainmaker weapon or simply spray ink everywhere you’ll need to work as a team to take on your opponents. Weapon choice, game plan, perks and sub weapons are all present so there is still that element of familiarity to be had. Why the game has excelled to second in my list though is down to the fact the game has kept me coming back. Not only thanks to the new weapons and stages that have been added over the year (free might I add), but also to rank up my Squid and buy the freshest gear I can. At the moment I’m rocking a football helmet, hoodie and hi-tops but that will definitely change as I unlock more and more. Never before have I ever taken to the whole user-creation side of things from games such as Trials Evolution or the LittleBigPlanet series. Their overly confusing and intimidating toolsets a huge put-off for someone who generally likes to just get on with the game itself. That all changed with Super Mario Maker however. Sure when I first got the game I knew I’d love playing a seemingly endless supply of Mario stages (that much was obvious), but little did I know that was only the beginning of what Nintendo’s latest had to offer. After toying with the first layer of items in the toolset a strange thing started happening… I was actually having a good time with it. I enjoyed placing mushrooms in question mark boxes. I enjoyed dropping a Goomba inside a pipe so they’d shoot out projectile-style. Whether I was recreating level 1-1 from the original Super Mario Bros, experimenting with scrolling stages or simply going with my gut there was always joy to be had. The number of back and forth battles I had with friends as we attempting to best each’s unique levels is too many to count thanks to the game’s great use of online sharing. Whether they were fair or full of cheap moments, there was always a pull to reach the glorious flagpole at the end. Even tackling random stages works so well thanks to a much appreciated “skip” button and searching system. Never before have I seen such a fantastic user-creation toolset as I have with Super Mario Maker. Simple and intuitive yet full of so much depth. Functional whilst also being full of character and charm. Tough to master but so so rewarding, creating has never been so much fun. Yes, I love sampling some old school 2D Mario platforming creations from users the world over, but any game that has me smiling as much as this simply by watching others try and fail at my nightmarish stages is okay by me. 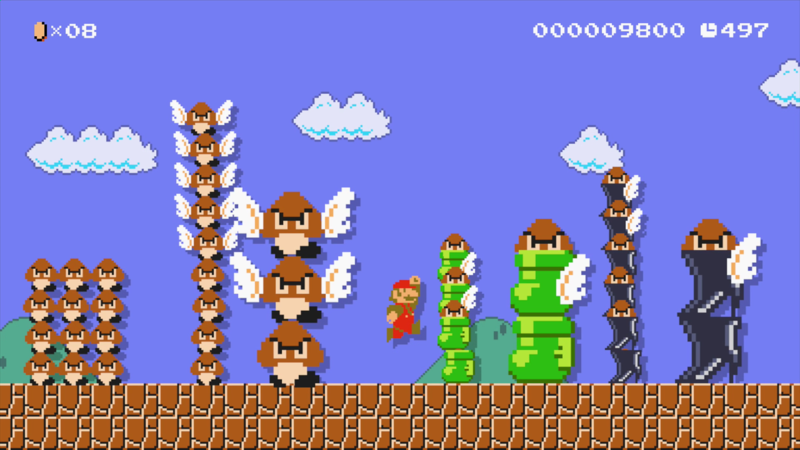 Super Mario Maker is the game we all dreamed of having as kids. Thanks to an intuitive tool set, decent sharing facilities and excellently quirky presentation values, Nintendo have given its fans the chance to in essence create their very own Mario adventure no matter how crazy it might be. And there we have it! What a year it’s been. With plenty to look forward to in 2016 here’s hoping next year’s list offers as many hits.